Housing advocates marched to the offices of Advanced Property Management in Hyde Park on Saturday. Housing advocates plan to pack Boston City Hall Monday to push for additional protections for renters facing eviction in the city’s hot housing market. However, tenant advocates have already agreed to drop their most controversial request: a mandate that rent increases of 5 percent or more be subject to nonbinding mediation. Instead, they are pushing for a rule that would require landlords to notify the city of rent hikes that result in eviction, known as a no-fault notice to quit. The proposal would still require landlords to give a reason for evicting tenants — such as failure to rent or property damage — and would bar full-building clear-outs, which sometimes happen when a new owner wants to overhaul an apartment building to get dramatically higher rents. And it would exempt landlords who are Boston residents and own five or fewer units. 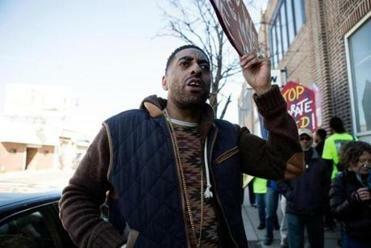 Housing advocate Antonio Ennis participated in a demonstration Saturday. But critics had used the mediation proposal as a rallying cry to get the tenant-backed measure killed. Local landlords called it a form of rent control in disguise that would effectively block nearly all evictions. Meacham said the intent of the mediation proposal was not to reintroduce rent control in Boston. But it became clear there wasn’t much room for compromise. It also reflects the tough political road faced by the measure, which hasn’t even been filed with the City Council yet and has its first public hearing Monday. During last fall’s campaign, a number of City Council members said they supported the idea of a just-cause eviction law but wanted to see specifics. Mayor Martin J. Walsh said in December that he liked the idea, too, and this year launched an Office of Housing Stability to help tenants who face losing their apartments. But so far he has not taken a position on just-cause evictions. So the bill’s advocates — a coalition of about three dozen neighborhood, labor, and tenant-rights groups — plan to pack the council chambers with hundreds of supporters, calling the issue a “litmus test” for members. They won’t be the only ones there. Greg Vasil, chief executive of the Greater Boston Real Estate Board, said some small landlords from his organization will testify against the plan. 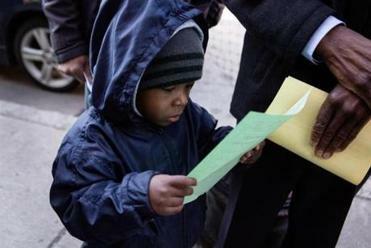 Telis Sebastian, 3, read a leaflet at the rally. He and his grandmother, Mary Pierre, live together and are facing displacement because of an unexpected increase in rent of $400. Skip Schloming from the Small Property Owners Association will be there, too. And while he was glad mediation is off the table, he said requiring evictions be registered with the city is just another way for housing advocates to target landlords. 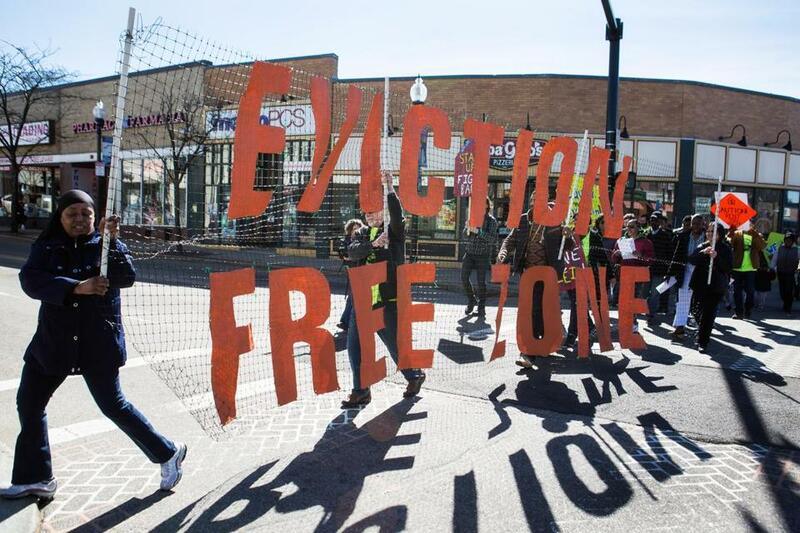 “If they do that, they can apply their pressure,” Schloming said, citing the case of a landlord in Egleston Square who, he said, had to sell his building for far less after advocates organized tenants for a rent strike and sued him. Vasil said landlords are worried about the cumulative effect of several housing proposals, including a hike in development fees and a potential ballot question that would create an extra property tax. But he warned the advocates might end up overplaying their hand. But Meacham said the new plan is a good compromise that protects renters — in a market where many have few options — without reaching too far.